The Panasonic DMW-XLR1 XLR Microphone Adapter provides 2 XLR inputs to the Panasonic GH5 & GH5S. 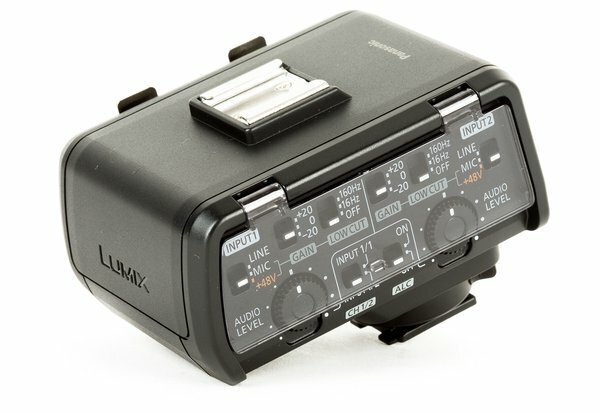 It is entirely powered through the hotshoe of the GH5 and GH5S, so there are no additional wires besides the microphone (not included) of your choice plugged into the XLR ports. A control panel with a clear cover allows you to make adjustments on the fly such as gain, low cut, and levels for each input. It supports high res formats up to 96 kHz and 24-bit. A cold shoe fits on top to connect an appropriate mount.